Thoughts are important: they determine our destiny! 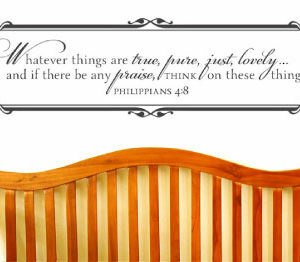 Paul in his joy filled letter to the Philippians told them to think on certain things. We need to pay attention to what he said. Want a Godly life? Change your thought life! 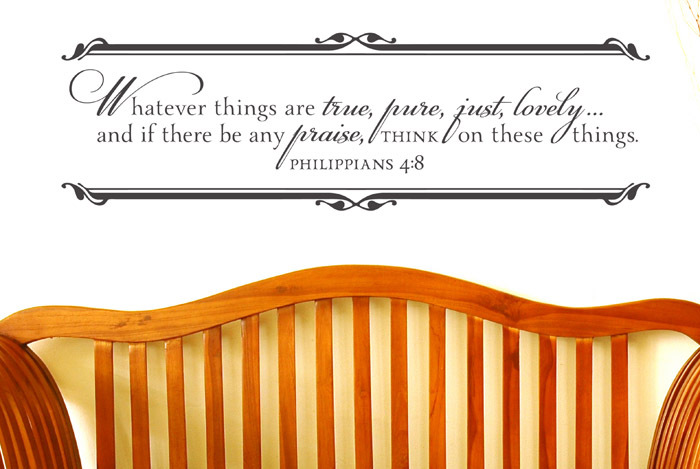 ‘Whatever things are true, pure, just, lovely…and if there is any praise, THINK on these things. 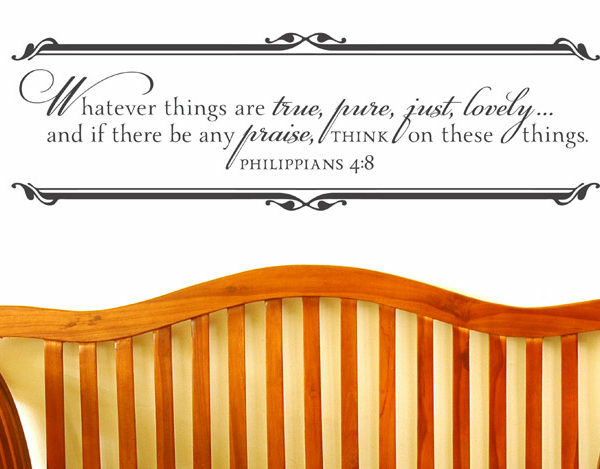 PHILIPPIANS 4:8’ wall words are ideal for all rooms: from the family room to the kitchen! In this photo, the wall lettering looks great above the chair. 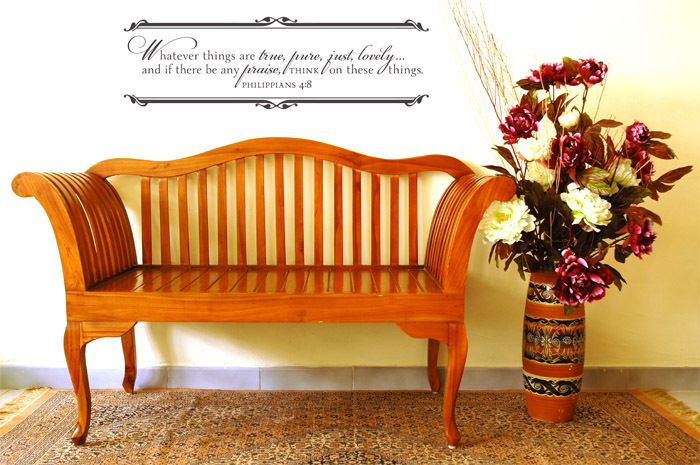 On the floor are a carpet and potted flower arrangement whose mix of colors ties in well with the wall quotes. Thinking Godly thoughts will not difficult in this atmosphere! At DecorativeLettering we have wall lettering that is suitable for your corridors as well! Have a look at our different categories; from the foyer to the bedroom: you will be pleasantly surprised! Our wall words come in various sizes, colors, and styles. 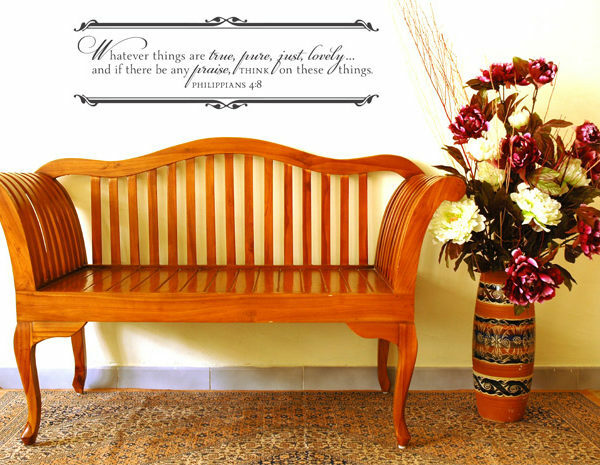 This means that you will be able to find wall quotes that will fit into your wall space: big or small! Try DecorativeLettering products. They are affordable. If you sign up, you will receive points for every purchase. If you refer us to a friend, you will also earn points! Now that is a deal! Do call or email: we’d love to hear from you!